Mini Chocolate Chip Meringue Cookies ~ Learn, Live, and Explore! 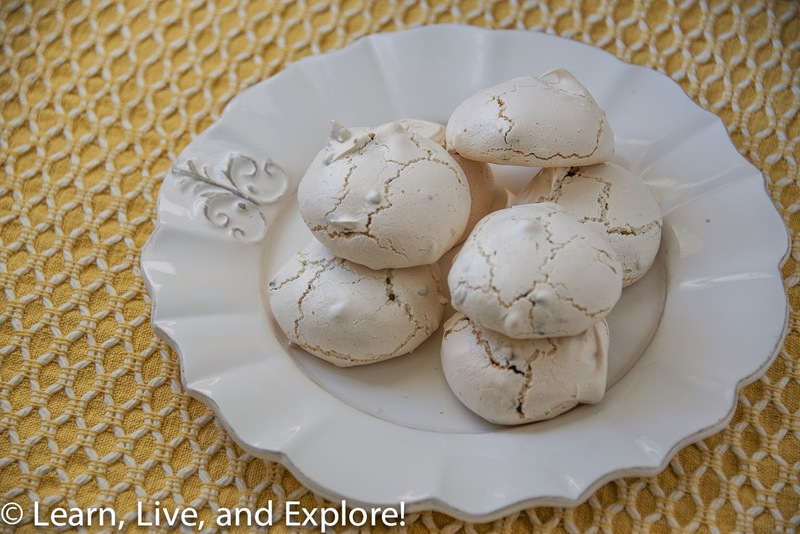 Growing up in the Pacific Northwest was not the easiest when it came to making meringue cookies because of the sensitivity to humidity (or endless rainy days), but my mom still managed to make these chocolate chip meringues for me every so often. It's all the sugar's fault because it likes to absorb moisture, so it prevents the egg whites from getting stiff enough maintain their consistency. I'll be honest with you, these cookies in the photo ended up being great on day one, but the moisture got to them and made them soft and chewy in the center on day two, so clearly it was not a humidity free day when I baked them. Because of all this hassle, normally, I find my self getting my meringue fix from Trader Joes or Whole Foods prepared cookies, but I decided to go for it and make a batch to bring to work. These cookies are relatively "light" in calories...well only because there's no butter, but the chocolate kind of makes up for that. And while they can be a bit messy, they were a great hit with my coworkers as an alternative to the traditional chocolate chip cookie. Bake for 25-30 minutes, watching for browning and doneness, then turn the oven off and let cool in the oven for another 30 minutes. You can tell when the meringue is done because it will lift off the parchment paper easily. If you are not going to eat the cookies the same day, make sure that they are stored in an airtight bag or container because of the sensitivity to air moisture.